Everything is getting more and more complex. We are all overwhelmed by the amount of information we encounter daily. Whether it be for work, for school or for more personal endeavors, there is a deepening need for people to understand how to make sense of complexity. The tools and processes you need to do this kind of sense making, are not hard to learn, expensive to master or even tough to start using. Yet, they are also NOT part of many people’s education experience. 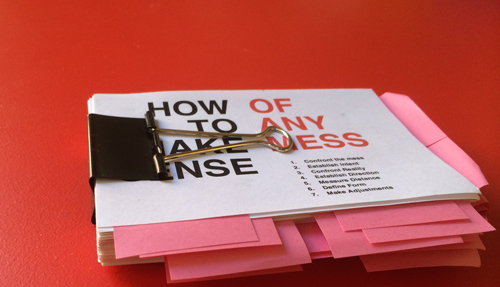 ‘How to Make Sense of Any Mess’ is a small format, hand illustrated workbook that introduces a total novice to the practice of information architecture. The book will be available only via limited run, opening for pre order later this summer. Sign up on the mailing list if you are interested in receiving notifications about this project. 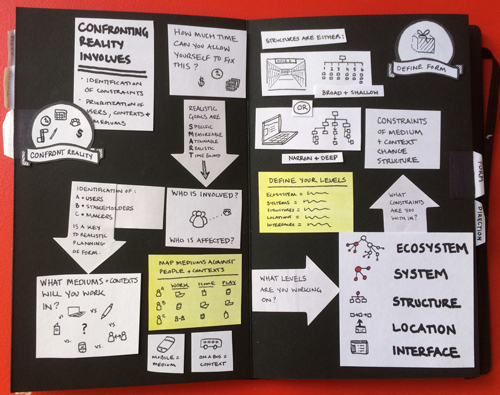 I am writing this book for people that don’t yet know the clarity that practicing information architecture can provide in the turbulence of getting things done. 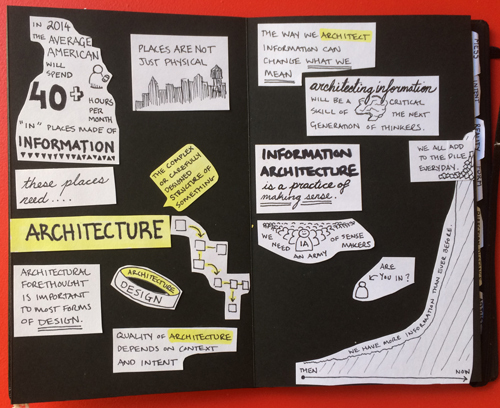 Over the last year, I have done research, made prototypes, and talked to a lot of people about information architecture and how its core concepts apply and affect the world around us. I have asked myself some core questions, all of which helped me to center on the format, tone and content of the book I plan to self publish this fall. Below is a brief account of what has happened thus far. I started by thinking how silly it would be to reduce important considerations to such a small, and private interaction as a workbook. 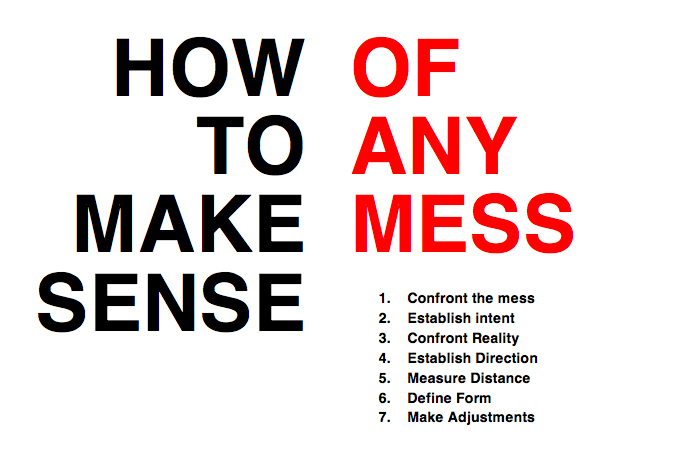 Would that insinuate that it really is “that easy” to make sense of anything? Then I started to really ask myself “Would the world be a better place if it were that easy?” And I decided the answer was yes. I also came to believe that a workbook format properly highlighted that almost everything that is “in the way of clarity” is put there by people. In this particular prototype, the addition of a glow-in-the-dark binding and feature burst was an obvious nod to my ongoing fascination with pop culture and advertising. Next, I wanted to challenge information architecture to be a simple enough concept to educate people on in an elevator. 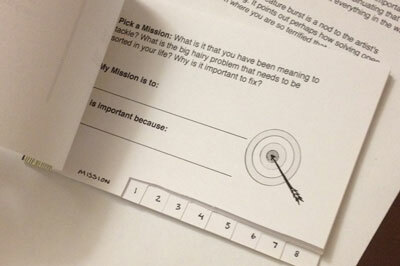 The intent of this tiny book is to act like a business card for people who seem to be intrigued by the words information architecture, but do not have the words to describe what they think it means. Throughout this process I have pondered the right age to introduce information architecture concepts and tools. To put something out into the world to test with, I created this short and activity-based book aimed at parent and child understanding a core component of Information Architecture, ontology. I have had the unique opportunity to test my content and ideas on two groups so far, both fall within the group I intend to reach with my work. I spent the fall of 2013 using the content of the book in my Information Architecture undergraduate studio class at Parsons. The first draft of the book was a 40,000 word, nine chapter, hand illustrated monstrosity. My students were generous with their feedback and I was able to test many of the definitions and assignments I was experimenting with the simplification of. Next I took the content I had developed and used it to teach a thesis class at the School of Visual Arts in the Spring semester of 2014. I was asked to lead 15 students through the last semester of their thesis process. The result was 15 test subjects for my methodology. 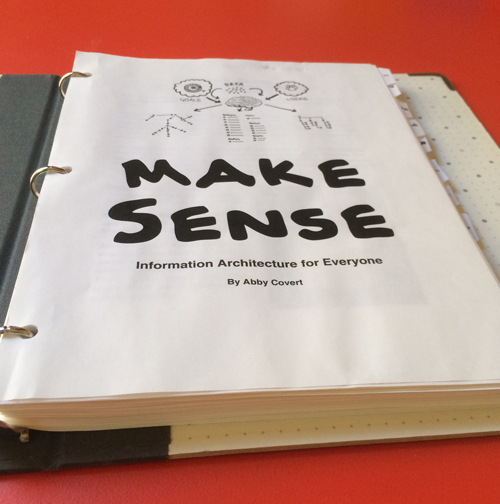 I have had various other readers at this point, and can’t wait to hear more feedback from more folks just learning about the power of information architecture. As I have proceeded through the writing, editing and re writing of this book I have had a few distinct moments where I realized I wasn’t “eating my own dog food” — each time I took the step back to apply the lessons of IA to the book itself the results were staggering. Two such moments are the map I made for my students to guide them through the semester and the map I made for myself to write the book by which you can see below. The book will be available via limited run, opening for pre order later this summer. Sign up on the mailing list if you are interested in receiving notifications about this project.